You don’t need to warm up water in the microwave or on the stove. 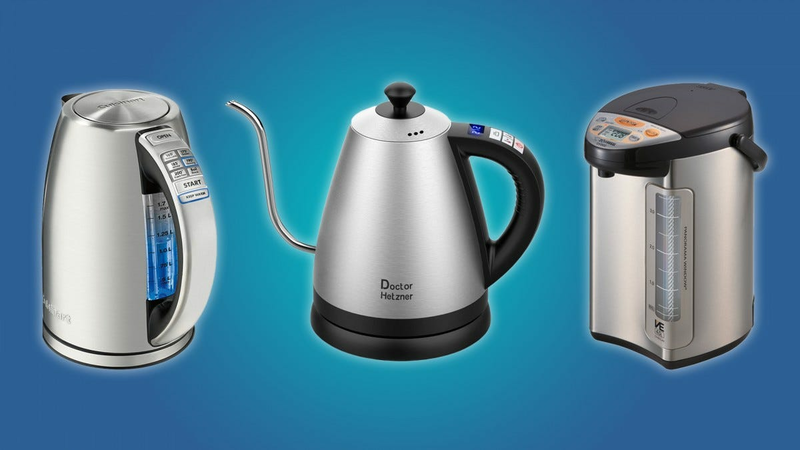 Electric kettles are cheaper than ever, and they can help you make the most out of your tea or coffee drinking experience. Electric kettles are now more of a necessity than a luxury in most kitchens. They’re easy to use, and they boil water a lot faster than your stove top. Because all electric kettles come with auto-off features, you don’t have to worry about burning the house down in a moment of forgetfulness. Some electric kettles have temperature control features, which makes it easy to create the perfect pour-over coffee or cup of green tea. Not to mention, they’re great for cooking pasta, blanching vegetables, or making some instant noodles. But not every electric kettle is created equal. They come in many shapes and sizes, and some lack features that you may not be able to live without. That’s why we’ve picked out the best electric kettles that you can buy right now. There’s something for everybody here, whether you’re a tea-addict or a ramen noodle chef. Also, we’ve avoided any kettles that have plastic elements or lining, because the taste of plastic happens to be both disgusting and terrible for you. Point-blank, the Cuisinart programmable kettle is a consistent and straightforward electric kettle. It has six labeled temperature settings, so you can effortlessly heat water for different situations. It also has a keep-warm feature that can run for about a half an hour, and an attractive steel and glass construction. The Cuisinart is easy to clean because its 1.7-liter body is big enough for you to fit a hand in. It also has a washable scale filter (the mesh that keeps calcium buildup from getting in your drink). 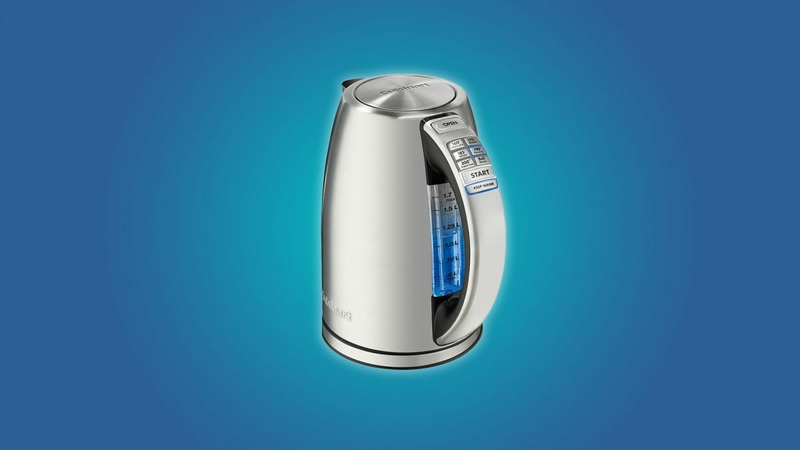 Hot tip: boil a mix of water and vinegar in your electric kettle to make cleanup easier. Just remember to rinse out the kettle afterward, or else you might end up with hot vinegar in your morning coffee. The Cuisinart’s pre-set temperature controls make it easy to find the correct temperature for your cup of tea or coffee. But you can’t punch in an exact temperature, so you’re limited to the options that are on the kettle. If you just need a low-maintenance electric kettle that can quickly heat water to a few common temperatures, then you should consider the Cuisinart. If you think that you’ll need to bring water to odd or specific temperatures, like 90 degrees or 175 degrees, then you consider some of the other kettles in our roundup with more precise controls. Here’s an electric kettle that can bring water to specific, user-programmed temperatures. The Doctor Hetzner electric kettle has a little LCD screen that displays the target water temperature. You can adjust your desired temperature to anything between 104 and 212 degrees, which should fill any of your cooking or drink making needs. The Doctor Hetzner also has a keep-warm function, but it only runs for about a half hour. The Doctor Hetzner has a sleek and utilitarian design. It’s made almost entirely of stainless steel, so you don’t have to worry about breaking any glass. It also has a goose-neck, which ensures precise and spill-free pouring (unless you get impatient and turn the whole kettle upside down). Despite its perks, there are a handful of tiny downsides to the Doctor Hetzner. For starters, it doesn’t have a memory function, so it resets to 212 degrees every time you finish using it. It also doesn’t have a scale filter, so if you’re using unfiltered water then you’re going to want to clean this thing regularly. Otherwise, you might find some hard water artifacts floating around in your tea or coffee. Although this kettle is waterproof and easy to clean, the lack of a scale filter may be important to people who are bad at cleaning their appliances. The Hamilton Beach is a typical and inexpensive electric kettle. It has a glass body, a steel heating element, and a scale filter. You can’t program different temperatures into this kettle, it just fully boils the water every time. Like other electric kettles, the Hamilton Beach has an auto-off feature, so you won’t burn your house down if you’re forgetful. 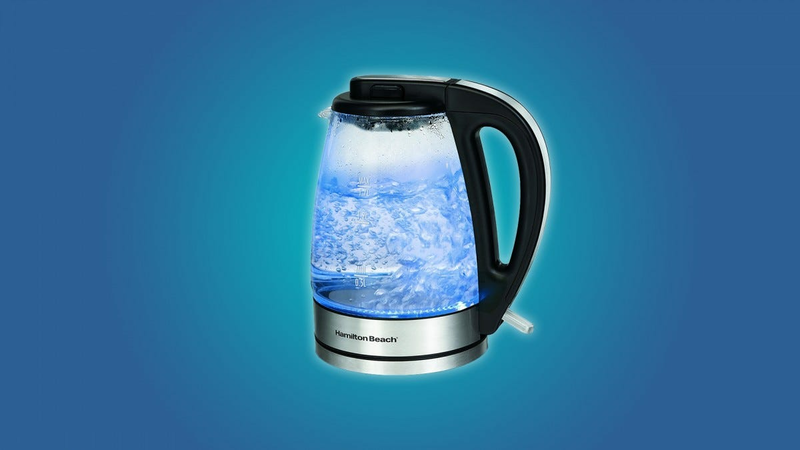 If your goal is to boil water without spending much money, this kettle will suit your needs just fine. 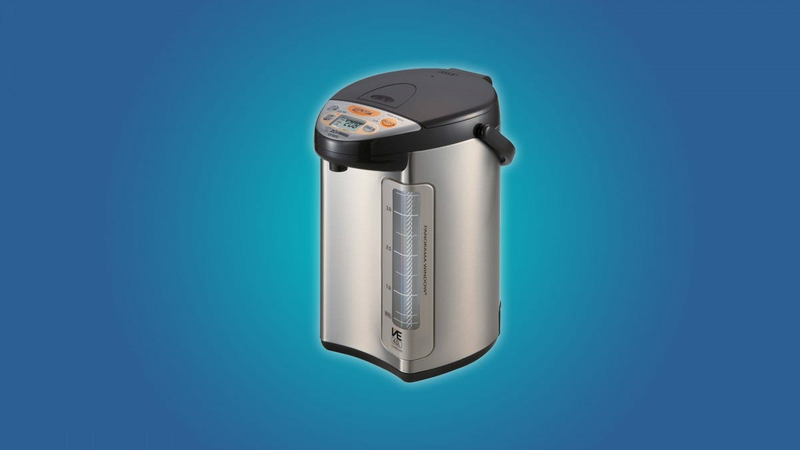 It’s easy to clean, has a filter, and can quickly boil up to 1.7 liters of water at a time. The Hamilton Beach isn’t the most luxurious electric kettle that you’ll come across, but it’s durable and does its job. We’ve intentionally avoided any kettles that are lined with plastic, but it’s still difficult to find electric kettles that don’t have plastic handles, lids, or scale filters. The Bella ceramic tea kettle is a great choice for people who want to fully avoid any plastic construction, as it’s almost entirely ceramic. The heating element is made of metal, of course, but it’s tucked beneath a layer of ceramic. 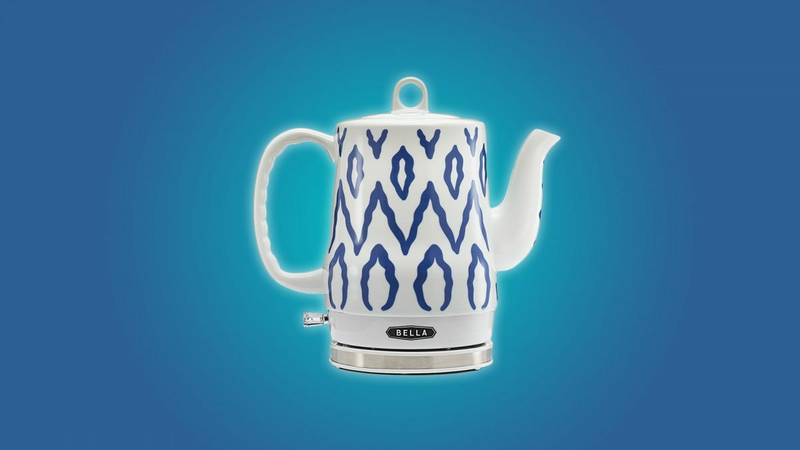 The Bella electric kettle also looks very homey, and it has a traditional feel. Its ribbed handle makes it easy to get a comfortable grip, and its cute little spout will keep you from pouring boiling water all over your stuffy tea-time guests. 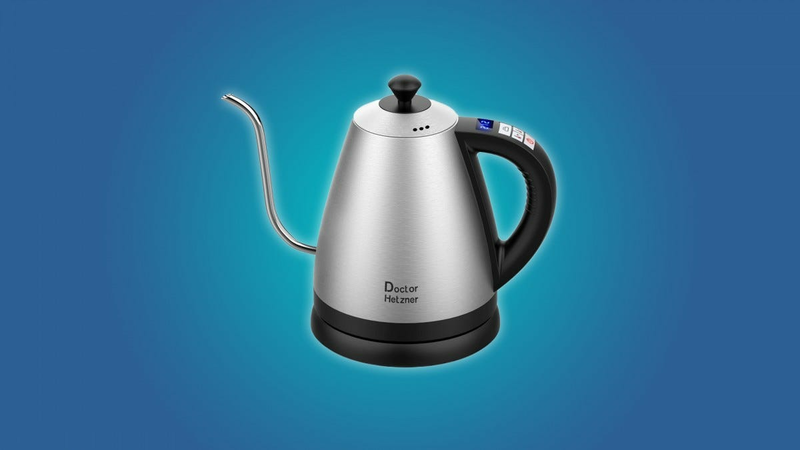 For the price of this kettle, you could get something with a lot more features. The Bella doesn’t have any temperature control settings, and it doesn’t have a keep-warm feature (although its ceramic construction should keep water relatively warm). But the Bella electric kettle is still a great option if you just want to boil water in something that’s safe and good looking. If you’re a devout tea or coffee drinker, then you should consider buying the Zojirushi thermo pot. Like a high-end electric kettle, the Zojirushi has temperature control features, a keep-warm feature, and a solid steel construction. But this thermo pot can also outperform any electric kettle because it’s built for convenience and efficiency. The Zojirushi doesn’t need to be refilled as often as an electric kettle, because it can hold up to 4 liters of water. It’s lined with a non-stick material (like a rice cooker), so it’s easy to clean. And if you don’t like to wait for your water to boil in the morning, you can set the thermo pot’s timer in advance. The Zojirushi also has an energy-efficient “vacuum” setting that keeps water warm for hours at a time by forming an insulated vacuum. If you boiled some water in the Zojirushi at night and then set it to “vacuum,” you could expect your water to still be scalding hot in the morning. This works a lot better than a kettle’s keep-warm setting, which usually only works for about a half hour at a time and consumes a lot of energy. Of course, this is a pretty over-the-top alternative to an electric kettle. If you don’t mind refilling a pot or waiting two minutes for water to boil, then there’s no reason to spend more than $100. But if you live in a house of tea-fiends, or you really want to pamper yourself… well, then it might be worth investing in something like this. Toaster ovens are great as a replacement or accompaniment to a conventional oven. Smaller, more energy efficient, and flexible, there’s a lot of good reasons for purchasing one. But, which toaster oven is the best one to purchase? We’ve tracked down some of the best of the bunch.